Secure the tree: With a small base in relation to its size, the Christmas tree is already unstable. A curious dog or a cat that likes to climb can spell disaster. Using a heavy base will add stability to the tree, and you can also secure the tree to the ceiling or a wall with small hooks and nearly invisible fishing line (placed high enough that your pet can’t chew it). Placing the tree in a corner will also add some stability. No chewing: The tree itself is considered mildly toxic; the bigger danger is the risk of intestinal obstruction or perforation of the gastrointestinal tract should your pet ingest the sharp pine needles. Keeping your cut tree well-hydrated to reduce the number of dry pine needles falling off the tree. Also keep in mind that the water in the tree holder can contain pine resin, preservatives and other chemicals that your dog or cat should not ingest. A Christmas tree skirt can keep the water covered and out of reach. Choose safer ornaments: Try to avoid fragile and glass ornaments. 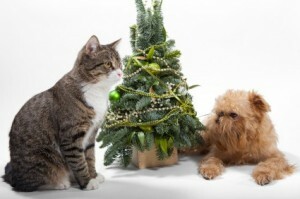 Broken ornaments can cause injury to your pet if chewed or stepped on. If possible, use non-breakable decorations such as wooden, fabric or plastic ornaments, or decorate with fabric bows. If you must use glass ornaments, place these higher on the tree out of reach of your pets and make sure the ornament is securely attached to the tree. Avoid tinsel, “angel hair” and string which are a magnet for cats and can cause a dangerous intestinal obstruction if swallowed. Be safe with the holiday lights: Younger dogs and cats are more likely to chew on electrical cords. If possible, place the string of lights higher up, out of your pet’s reach. Unplug the Christmas tree lights when you aren’t home to supervise, and tape down the wires so they’re more difficult for your pet to chew. Watch the Christmas presents: Those gaily wrapped presents are enticing for pets as well as to the recipients, especially gifts that contain food. Besides spoiling the surprise if your pet tears open all the gifts, ingesting ribbons, bows or the contents of the gifts can result in gastrointestinal upset, blockage or perforation.